Classic black-and-white photos show folks "on the town"
“On the Town” at Monroe Gallery is a survey of more than 50 classic black-and-white photographs of people out to celebrate and have a good time. The press release explains that the phrase “on the town” is probably derived from the old English saying “going to town”: “to arrive or make one's mark where significant things are happening.” The American adaptation “on the town” came to mean “in spirited pursuit of the entertainment offered by a town or city,” probably dating from the 19th century when going to town for an outing was a big day for country folk. “Out on the town” can also refer to photojournalism, a type of nonstudio social-based photographic practice. The images in this exhibition were commissioned by the Farm Security Administration, the motion picture industry, or journals such as Life, Look and Time magazines from the 1930s through the 1960s. 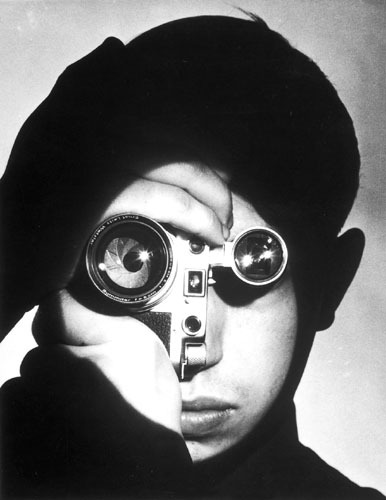 Alfred Eisenstaedt (the father of photojournalism) and Carl Mydans were staff photographers for Life. “On The Town” is nicely installed. Based on subject or visual correspondences (rather than photographer), the images loosely flow one into one another through various subthemes or categories like “dancing,” “drinking,” “eating,” and “night lights,” picturing social rituals and people (across class and race) in different geographic locations, having fun in public places like bars, clubs, restaurants, cafes, drive-ins, community centers and amusement parks. We see professional dancers like Gene Kelly, the chorus lines of Las Vegas show girls, go-go dancers on “Hullaballoo,” and regular folks of all ages just “letting go” and moving to the beat. 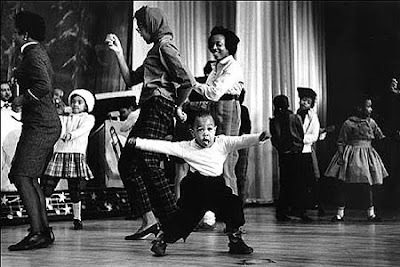 Steve Schapiro's “Amateur Hour, The Apollo Theater,” showing moms and kids dancing up a storm; Cornell Capa's “The Lindy Hop, The Savoy,” depicting an African-American man and woman dancing in front of what appears to be an all-white audience sitting on the floor; and “Teenagers at a Party” drinking Coke and slow dancing by Nina Leen (one of the first women photographers for Life), are examples of the latter. Before he emigrated to the United States in 1935, Eisenstaedt, the most published photojournalist in the world, photo-documented the rich and elite of Europe. Classic images from this period — “Premiere at La Scala,” “Ice Skating Waiter,” “Waiters Watching Sonya Henie Skate” and “Swimming Pool in Café in Paris Hotel” — are included in the exhibition. Bob Gomel's document of American privilege, “Tailgating, Yale Football,” pictures a chauffeur doubling as bartender pouring drinks from the back of a Lincoln Continental for rather stiff alumni queued in their suits. I love checking out the rich and famous who always seem to be “out on the town” — Sophia Loren, Jayne Mansfield, Barbra Streisand, Mia Farrow, Frank Sinatra, Nat King Cole, Jackie Gleason, Marilyn Monroe, David Bowie, Andy Warhol and Edie Sedgwick — but my favorite photographs in the exhibition are not of glamorous people or places. 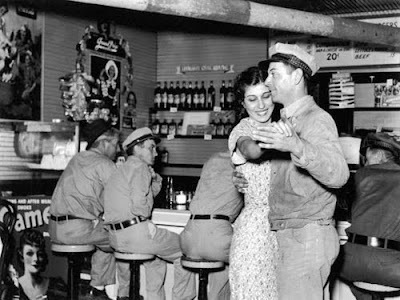 Gomel's photograph of the rowdy crowd at “The Red Onion” in Aspen; Guy Gillette's image of a father and two sons sitting at the counter in “Arnold's Café, Lovelady, Texas”; and Carl Mydans' “The Loungers Hang Around the Duval Club” and “Dancing at Rosie's Café,” both photographed in Freer, Texas, are just a few that capture simple pleasures. 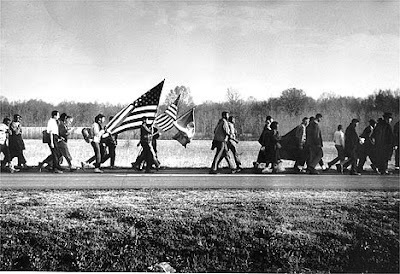 Documentary photographs can suggest narratives. Verner Reed's “Brunswick Hotel, Boston, Massachusetts” (1957) depicts four elderly women dressed in their best for afternoon tea with the priest. 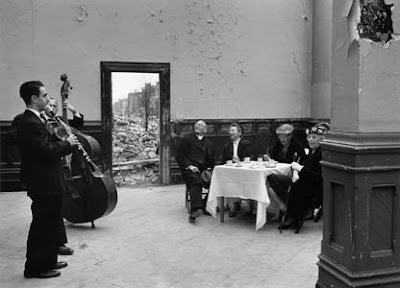 In contrast to the formal white tablecloth and musicians, the hotel walls are peeling and full of holes — a doorway opens onto a pile of rubble. One wants to read the image within histories of photography documenting cities bombed during World War II, except it's Boston and one can see the city beyond the rubble. Apparently, the Brunswick had a large number of residents, retired actors and actresses, who spent their time in elaborate dress, having tea, and later drinks, in the once ornate, now dilapidated hotel lobby about to be torn down — one last tea before the hotel and way of life would be demolished, a scene reminiscent of the musicians in the film “Titanic” who kept playing as the ship went down. Ernst Haas' “Dream Ball, New York” (1952) is equally intriguing. Given the secrecy and paranoia that forced gays out “on the town” into private clubs and parties during the McCarthy era, it's not surprising that there is only one non-heterosexual image in this otherwise hetero-survey. 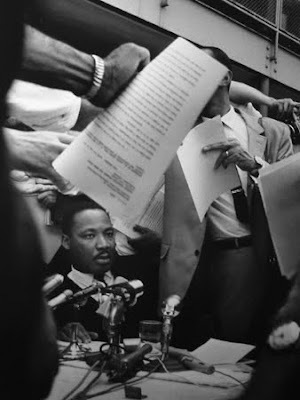 Interestingly, this image is interpretive — fuzzier than the sharp documentary crispness of most of the other images. A suited man with two drinks in his hand walks in on what appears to be two men dancing together cheek-to-cheek in the smoke-like blurred distance (no surroundings are discernible). These photographs (most are gelatin silver prints and a standard documentary 16-by-20-inch size) are documentation of an era, conveying a certain sense of nostalgia that comes from the medium — “film” versus digital photography — as much as the subjects of each photograph. “On the Town” is a delightful exhibit, up for one more week. I guarantee it will uplift your spirit. Exhibition continues through January 31, 2010. 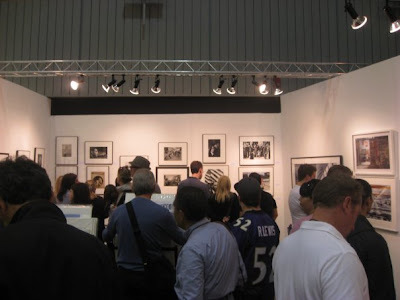 Over the past eighteen years Photo LA has earned a reputation as one of the foremost art fairs and the leading photo-based events in the country. Presenting the finest galleries from around the globe, the 19th edition of Photo LA featured photographic art from the earliest 19th-century photographic experiments to the most contemporary photography and photo-based art. The fair opened to enthusiatic crowds at Thurday's opening benefitting the Wallis Annenberg Photography Department at the Los Angeles County Museum of Art, and continiued to attract collectors and photography fans through out the weekend. There are some good blog posts on-line starting to appear reviewing the exhibit. 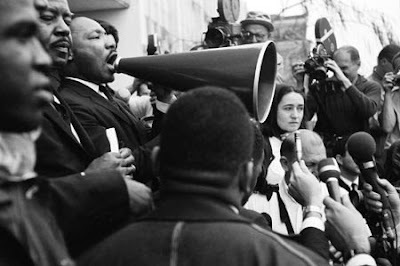 Monroe Gallery exhibited several key examples of important vintage photo journalism. Also featured and admired were Richard C. Miller's photographs of Elizabeth Taylor and James Dean taken during the making of the film "Giant". 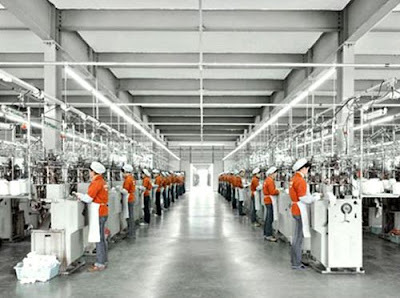 We featured several of Stephen Wilkes' large format photographs from China depicting a nation amidst rapid and vast transformation. 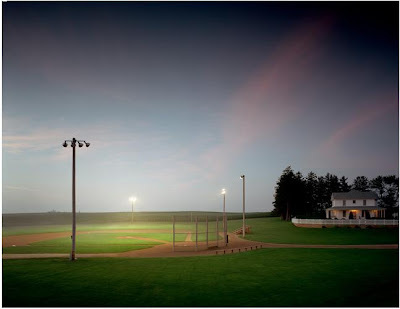 Next up, the AIPAD Photography Show in New York, March 18 - 21 at the Armory. We hope to see you there! 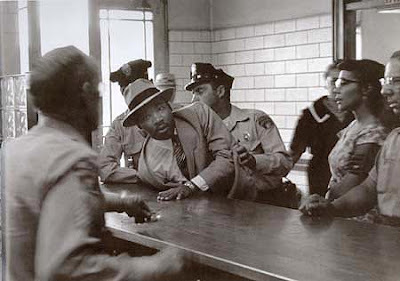 On this day, we honor Martin Luther King Jr.
"While confined here in the Birmingham city jail, I came across your recent statement calling my present activities "unwise and untimely." Seldom do I pause to answer criticism of my work and ideas. If I sought to answer all the criticisms that cross my desk, my secretaries would have little time for anything other than such correspondence in the course of the day, and I would have no time for constructive work. 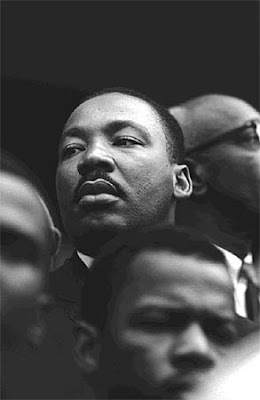 ...But more basically, I am in Birmingham because injustice is here. Just as the prophets of the eighth century B.C. left their villages and carried their "thus saith the Lord" far beyond the boundaries of their home towns, and just as the Apostle Paul left his village of Tarsus and carried the gospel of Jesus Christ to the far corners of the Greco Roman world, so am I compelled to carry the gospel of freedom beyond my own home town. Like Paul, I must constantly respond to the Macedonian call for aid." Monroe Gallery of Photography is pleased to exhibit at the 2010 edition of this venerable Photography Fair January 14 - 17, 2010. 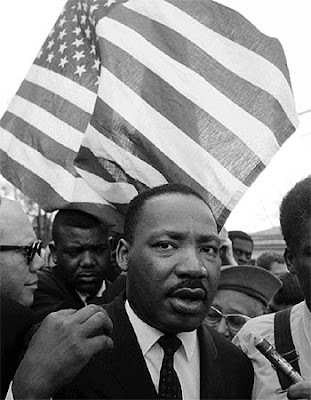 We will be exhibiting specially selected work from the gallery's collection: several new acquisitions, new photographs from Stephen Wilkes, important civil rights and photoournalism prins, and introducing the work of the acclaimed photojournalists Guy Gillette, Irving Haberman, and Richard C. Miller. Visit our extra-large booth #A-1 located in the front-left of the exhibit. Returning to the Santa Monica Civic Auditorium, photo l.a. 2010, the 19th Annual International Los Angeles Photographic Art Exposition moves back to it's former home at 1855 Main Street, Santa Monica, California. Conveniently located, just off of the 10 Freeway and two blocks from the beach. More details here. Look for updates from the exhibit on the Monroe Gallery Facebook page. We look forward to seeing you this weekend! Dennis Stock, whose photographs may have done almost as much to create James Dean’s public persona as the actor’s own performances, died Monday in Florida. He was 81. The announcement was made Wednesday in New York by the Magnum Photos co-operative, where Mr. Stock was a member and a mainstay for six decades. Yes. Six decades. Stock’s choice of subject, his attitude of observance, the ‘color’ of his interests, reveal him as truly of his time, not in the sense of being ‘with it,’ which has to do with the ephemeral and fashion, but in the sense of attunement to the temper of American modern experience. As a 23-year-old, Mr. Stock came to national attention in 1951 when he won the first prize in the story division of Life magazine’s young photographers’ contest for his essay on the arrival in New York of displaced persons from Europe who had been homeless since the end of World War II. Dennis is probably best known today for his 1955 essay on James Dean — and specifically for a single image of Dean, in Times Square, walking the ‘Street of Broken Dreams,’ his shoulders hunched, his head pulled low inside an overcoat. The essay appeared in Life and did much to help make the short-lived actor a cult figure. Mr. Stock avidly kept track of new developments in photography and regularly submitted comments to the Lens blog — on the work of Christopher Anderson, John Trotter, Bill Eppridge, Emilio Morenatti and the depiction of suffering in art. Mark Lubell, Magnum’s New York bureau chief, said he had been in discussions with Mr. Stock as recently as two weeks ago about future distribution plans. “Dennis’s dedication to his craft and his desire to ensure Magnum’s future have been extremely important to the organization,” he said. The opening night reception will benefit the Wallis Annenberg Photography Department at LACMA and is hosted by noted photographer David LaChapelle and actor /photographer Chris Lowell. To order tickets visit: www.lacma.org/art/photola.aspx or email photola@lacma.org Please check their website for LACMA’s curated lecture program programming schedule. Los Angeles continues to be home for more and more artists and it has become a major creative center for the production of photography and photo-based art," says Stephen Cohen, producer of Photo L.A., owner of the Stephen Cohen Gallery in Los Angeles. "Photo L.A. 2010 presents an international array of galleries and artists giving to curators, collectors, critics and art enthusiasts the opportunity to enjoy the best photography that our city and the world have to offer. Now in its 19th year, it is the longest running art fair in Los Angeles, and it will be a major cultural event in the Los Angeles fine art landscape." Photo L.A. will feature the photographic art from the earliest 19th-century photographic experiments to the most contemporary photography and photo-based art. Many of the world's leading galleries and private dealers representing international and U.S. artists will display work at photo l.a. 2010. International galleries, including Galeria Sicart (Spain), Queensland Centre (Australia), Gallery Suite 59 (Netherlands), Czech Center for Photography (Czech Republic) and MR Gallery (Beijing), will participate in the fair. Contemporary Works/Vintage Works will also return once again to the fair, along with such major dealers as Halsted Gallery, Monroe Gallery, Susan Spiritus Gallery, Stephen White Gallery, Scott Nichols Gallery and DNJ Gallery--among many others. Phase One of the La Brea Matrix project will debut at photo l.a. 2010. The project is produced by The Lapis Press and Schaden.com with the support of the Goethe Institut and MAK Center for Art and Architecture. Photo L.A. will be open to the general public on Friday, January 15th, and Saturday, January 16th, from 11 am to 7 pm, and Sunday, January 17th, from 11 to 6 pm. Tickets are $20 for a one-day pass, $30 for a three-day pass and $10 for lectures. All exhibition, lecture and opening night benefit reception tickets are available for purchase in advance or at the door. For additional information on Photo L.A. 2010, including the opening benefit reception and advance ticket sales, visit http://www.photola.com/ . Buy tickets for regular admission.